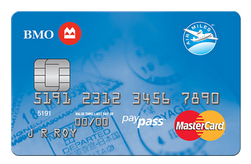 Yesterday the 800 mile sign up bonus for the no fee BMO AIR MILES MasterCard came to end. It has been replaced with this new offer that sees no bonus miles for getting the card but will rather award you double miles on all purchases for the first 6 months you have the card. This means the card will effectively earn 1 AIR MILES Reward Mile for every $10 spent rather than $20. For many this may not be as good of sign up bonus as the 800 mile offer but for those who can spend a lot you can make this new bonus pay off way more than the old bonus. You'll have to spend $16,000 to break even on the comparison of sign up bonuses (sign up bonus + equivalent spend) over those first 6 months. That's quite a bit to put on no fee card that usually comes with a lower credit limit.